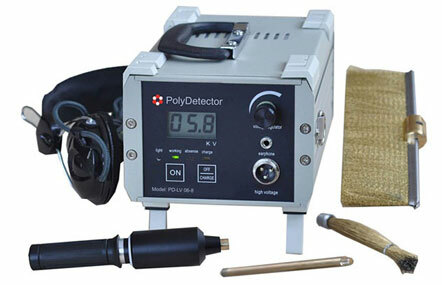 Polydetector also known as holiday detector or pinhole detector, is an electrical device used to determine the location of a gap or void or porosity in an anticorrosion coating or linings. These anti-corrosion coatings or linings can be on a concrete, metal or any conductive surface. The pinholes or porosity in the anti- corrosion coatings or linings are actually defects that may not be visible during a visual inspection. Operation is very simple. When the wire brush of the pinholes detector or holiday detector passes over these pinholes or porosity, sparks are produced and alarm sounded. Depending on the model selected, the detection range is 30 micron ~ 1mm or 0.5mm ~10mm thick. Polydetector is the leading portable instrument for detecting Pinholes – Porosity – Cracks and Thinning in coatings or linings during Coatings inspection or and linings Inspection.